A sample of the process that went into one Ohio Story script. Remember that writing in the 1940s and 1950s was accomplished through a series of drafts - outline, rough draft, first draft, final draft, etc. Authors could not correct and edit in the same document like we do now with computer technology. 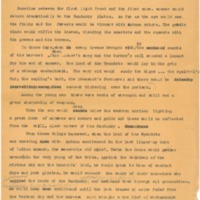 Siedel, Frank, “Frank Siedel -- Colonel Johnson's Commission,” The Ohio Story Radio Scripts, accessed April 20, 2019, http://www.ogsarchive.org/items/show/946.